So, super Saturday was last Saturday, and I decided to go. i didn't plan on going, but I packed up the kids, made sack lunches and headed out. I decided the night before to make truffles, Oreo truffles. I had these once before, and they were divine. I stayed up till midnight trying to get the white chocolate to drizzle over the tops, but it just wouldn't. i was ready to toss them, all 75 of them in the trash, but Brandon decided after all that work we should just put dots on the top with a spoon. So, after several hours of chocolate melting, rolling, and dipping we got it done. i know they aren't really pretty, but no one complained cause all 75 were gone! I only got one! 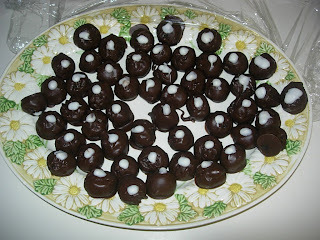 These are pretty easy to make, except for my handicap with the white chocolate, and they are even better to eat. cream cheese, Oreo's, and chocolate, that's it. 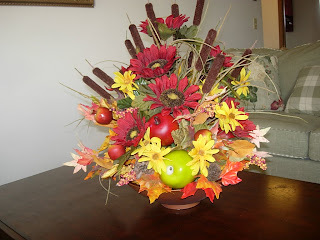 Also, while I was there i got to squeeze in to do a fall flower arrangement, thanks to Janelle. I have never really made an arrangement this big, so it took me a while, but it was fun, and I think it looks o.k. The kids are excited for Halloween, and I'm sure we'll be making our traditional Halloween sugar cookies. No wonder October through January we pack on the pounds, every thing's about eating! Oh well, we'll just make another ridiculous new year's resolution to not do it again. Cheers. Those are my favorite treats-I want some NOW!